Many years ago, a failed strike against the evil Reticulon system left mankind on the brink of extinction. In the year 2159, the Earth Federation Government unveils a high-performance star fighter, codenamed "Solar Striker". Accompanied by the Mother Athena, the Solar Striker must infiltrate the Reticulon core base and destroy their central control to save mankind. 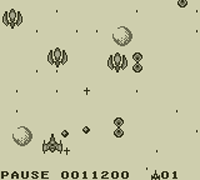 Enemies fly onto the screen in waves and you have to shoot them down while avoiding incoming fire. Improve your firepower with weapon pickups. There are six stages to play through, and at the end of each you must destroy an enemy mothership or superweapon.